Stairs offer a cheap and accessible way to amp up your cardio workout. 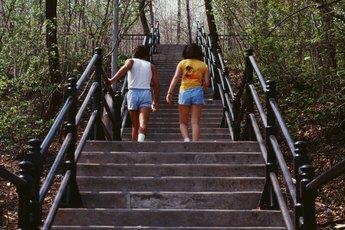 Stairs offer so much more than a way to get from point “A” to point “B” -- according to a 2009 “New York Times” article, stair climbing challenges your body 50 percent more than walking up an incline or lifting weights and it burns two to three times as many calories as walking on level ground. Despite the added benefits, walking up stairs engages and tones similar muscles as running, including muscles that span from the top of the leg to the bottom. If you're looking to tone your thighs, climbing stairs brings it in spades. This action engages the rectus femoris, quadriceps femoris and hamstrings of the thighs. The first two come into play during the stance phase -- when your body is momentarily planted on the stairs -- while the hams get a workout during the swing phase, the act of lifting your leg up to the next step. Walking up stairs also works the gluteus medius and gluteus maximus of the all-important buns during the stance phase. Just as you enter the stance phase of walking up stairs, specifically when your heel strikes the ground, you're working the medial gastrocnemius, the inner-rear muscle of the calves. As you swing up, the tibalis anterior -- a muscle that runs down the center of your front calves -- helps your foot clear the step. Not to be forgotten, the soleus of the side calf helps stabilize whichever foot is currently on the step. As you swing your leg to mount the next step, the motion causes the hip flexors of the pelvis and upper thighs to contract. These core muscles then expand when you enter the stance phase of the movement. On a secondary level, climbing up stairs engages the erector spinae of the back, which helps you maintain your upward stance as you make your ascent. 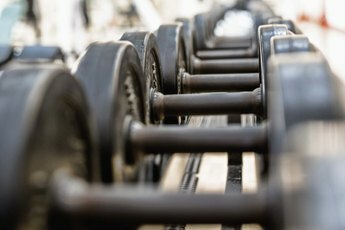 Although climbing stairs and running or walking all engage a similar set of muscles, stair exercise really shines when you consider how it engages these muscles. The vertical movement of climbing stairs makes your body work against gravity, which offers more intense muscle engagement than walking or running on level ground. Moving up stairs also challenges your leg muscles to stabilize and balance your body, as does walking down the stairs. The New York Times: Stairs as Fitness Tools? Runner's World: Is Stair Climbing Good Cross-Training?